Say Merry Christmas with discounts on the food & beverage bill, complimentary and discounted room night stays and access to the Swimming Pool or Gymansium at your favourite hotel. Indulge your loved ones and play Santa by gifting a hotel membership this Christmas and New Year. Last year, my wife and I threw a small Christmas party to celebrate with a few friends before we got ready to welcome the new year. It was a fun evening celebrated in festive spirit. In addition to the great time and memories we created, we were delighted to receive a hotel membership as a gift. I thought the Accor Plus membership was the perfect gift to welcome the new year – a gift one can use multiple times throughout the membership year. A hotel membership offers a number of card benefits valid for an entire year and a series of one-time use certificates. The first time we used our hotel membership was within the first week of receiving the gift. The Pullman New Delhi Aerocity was hosting a New Year bash at Pling, the elegant, sensuous and tranquil lounge-bar. 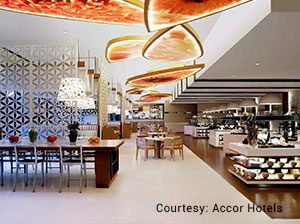 The hotel was offering a 25% discount to all Accor Plus members for reserving a table at the New Year party. I distinctly remember booking a table for 10 and receiving at 25% on the package. Our membership came in really handy while enjoying the festive season to the tee! Besides the festive season, we used our membership on several occasions like our birthdays and anniversary. We went out for dinner with our parents and children on our anniversary and used the Accor Plus certificates entitling us to a 40% discount and a complimentary cake. We were a table of 8 and saved a grand sum amounting to about Rs. 9,000. This was actually the first time I saw the real value of the Accor Plus membership. We gave the room night stay certificate to our daughter so that she could enjoy a relaxed staycation at the hotel with her friends. My daughter and her friends couldn’t stop raving about the time they had at the hotel – the room, the pool and the food. They had a great time at no extra cost. The room night stay offered by Accor Plus is valid across Asia Pacific. Unfortunately, we were unable to use the membership overseas this time. However, I plan to renew the membership in the coming year and avail the complimentary room night stay during our holiday over the summer. Asia’s most expansive loyalty program has expanded its horizon with the acquisition of two new hotel brands, Fairmont and Swissôtel Hotels & Resorts. At Fairmont, iconic and historic hotels offer guests extraordinary places, created by combining unique architecture and structure, and magnificent features. The addition of great service results is an unforgettable guest experience at Fairmont. On the other hand, Swissôtel Hotels & Resorts provide you with peace of mind while you explore the world. The Swiss hospitality ensures that your personal preferences will always be met and your expectations are exceeded as you experience all that Swissôtel has to offer. For all those wondering if the free room night stay across Asia Pacific is available at hotels of the newly acquired brands, the answer is YES! By 2019, the loyalty program’s benefits will role out in its entirety and offer a free room night stay at all Accor Hotels including Fairmont and Swissôtel Hotels & Resorts properties across Asia Pacific. Besides the lucrative room night stay available 2019 onwards, at the moment the program gives you more than 1100 restaurants to choose from when dining out. This is not only exciting news for lifestyle enthusiasts looking at buying the Accor Plus membership, its good news for existing Fairmont President’s Club and Swissôtel Circle members too. Active members will get a comparable level of status in the program, offering benefits across Accor’s entire portfolio of hotels. It’s not just about the room night stay anymore. Much like Accor Plus members, all legacy Fairmont President’s Club and Swissôtel Circle members will receive exclusive Accor Plus member rates, and earn Le Club AccorHotels Status and Rewards points with every eligible stay. Fairmont and Swissôtel Hotels & Resorts, now part of AccorHotels’ collection of luxury properties have a presence in two India cities. 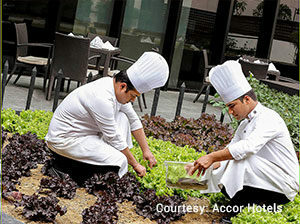 Accor Plus members can enjoy its benefits in Jaipur and Kolkata at Fairmont Jaipur and Swissôtel Kolkata. In India, some of the new restaurants where members can delight their tastebuds – and save up to 50% off the dining bill and 15% off drinks – include the spectacular rooftop restaurant Asmaa at Fairmont Jaipur as well as the renowned Darburi and Café Swiss restaurants at Swissôtel Kolkata. These two renowned brands now offer even more choice at iconic and celebrated hotels in Asia Pacific at Swissôtel Nankai Osaka, Fairmont Singapore and Swissôtel the Stamford Singapore among others. With more than 800 hotels and 1100 restaurants across Asia Pacific, there are more locations than ever before to enjoy your member benefits. I live in Bengaluru with my husband and two children aged 10 and 12 years. We could be called, in common parlance, a typical techie couple as both my husband and I work in the IT industry. As a family, we are always looking for some outing or an adventure to spend time together and extricate from our fast paced lives. We chanced upon the Accor Plus membership a while back through our friends who have been enjoying the various card and certificate benefits offered by the membership for a few years now. After hesitantly enrolling for it, one day we decided to try out the restaurants at Grand Mercure Koramangala, the nearest Accor Hotel to our home. Our children’s happiness knew no bounds when they got to know about our plan for dinner as they absolutely love hitting hotel restaurants and buffets to get their hands on unlimited waffles and other treats. 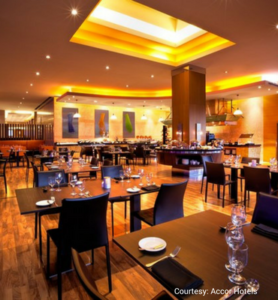 Off the several restaurants at Grand Mercure Koramangala, we went to get a meal at 12th Main. Aptly named after the location of Grand Mercure Bangalore, 12th Main offers an unparalleled experience into the world of global gourmet cuisine. A perfect intimate setting for casual dining along with an option of outdoor al fresco area seating for relaxed and pleasant evenings. An open live display kitchen where chefs prepare culinary masterpieces to fulfill preferences enhances the experience. At 12th Main, one can choose to dine à la carte or enjoy a wide range of buffet options for breakfast, lunch and dinner. 12th Main’s global cuisine was exceptional and the courtesy with which we were greeted at the hotel was an added treat to the visit. At the restaurant, our kids opted to get the dinner buffet, whereas my husband and I went ahead with their à la carte menu. By the end of the evening, we had indulged in a mix of Indian, Italian, and American food options. 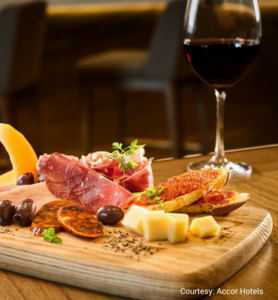 The food at 12th Main made our bellies happy and the Accor Plus membership benefits made our wallets even happier. It was for the first time that we actually realized for ourselves how much a hotel membership can help one save. We redeemed a certificate offering a complimentary buffet meal for two, which meant that our kids ate for free that evening. As for the rest of the bill, we availed a 50% discount through our membership card. On our way out on the same evening, we passed by the hotel’s poolside restaurant By the Blue and were absolutely mesmerized by how serene it looked. Almost instantly we knew that By the Blue was going to be our hangout spot during our next visit to out hotel. So, a few weeks later, with the kids in tow and a reservation at By the Blue for their Sunday Brunch, my family headed to Grand Mercure Koramangala yet again. We were more than surprised at what we saw! Live music, kid’s play areas, gaming consoles, live stations for pasta, huge salad bar, lip smacking north west frontier cuisine along with exquisite wines, spirits and cocktails had us bowled over. This was only the first of many Sundays we have spent there with friends and family. Thoroughly impressed with the card, we hope to make a regular feature to help us save on more occasions and celebrations. The last time I visited the Pullman New Delhi Aerocity was to celebrate my daughter’s exceptional result in exams and her admission to an Ivy League college in the States. I figured it’d be great for her to celebrate with close friends and family before she moves out for college. With our Accor Plus membership, we managed to call a group of 10 people at Pluck, Pullman Aerocity to celebrate the momentous occasion. Why Pullman New Delhi Aerocity? Even though the hotel is considerably new to the Indian market, we’ve been loyal patrons of the hotel brand for a few years now. We try and stay at the Pullman every time we travel overseas. Apart from comfort, convenience and service, it is very comforting to stay at a hotel owned by a trust worthy international hotel brand like Accor Hotels. Pluck at the Pullman Aerocity serves European cuisine with a ‘farm to table’ concept i.e most of their vegetable stock is either grown on location or locally ensuring the freshest meals on your plate. Visiting Pluck is like treating my family to a dose of health. Pluck is my personal favourite but Pling is another spot at the Pullman that keeps us coming back to the hotel for a drink or two. As I’ve already shared before, Pullman is one of our favourite hotel brands to stay at, so we decided to get a membership for the same to avail benefits. It offers a pool of benefits ranging from a complimentary room night, complimentary upgrade to the next category of rooms, complimentary Buffet Lunch, 40% off on the total bill for larger tables and many other property specific benefits. Benefits applicable on the food bill are the ones we use very regularly. The certificate offering a 40% off on the total food bill helped us celebrate my daughter’s special day. For a table of 10 with an average cost of 2,500 per head, we only paid Rs. 11,200. In addition to the fresh greens from their in-house organic farm, Pluck pulls itself apart from the rest with its mix of traditional and avant-garde menu. One would be amazed to see the diverse variety of food laid on our table – from fusion delicacies like Caviar Golgappa and Kaffir Lime Paneer Tikka to the more traditional vegetable Biryani. Honeymoon, that’s the one thing that everyone really looks forward to after the wedding, me and my husband being avid travellers were more excited for the honeymoon than our wedding. We both had saved enough for our wedding and very little for our honeymoon. So we mutually decided on travelling within the country. But was that the only option? I started searching for beautiful places within India and special deals on hotels. While going through the web I came across the Accor Plus page on hotelmemberships.com. I was pretty amazed at the benefits available on hotels in Asia Pacific. The membership gave access to a bouquet of top brands like Sofitel, Novotel, Pullman, Mercure and hotels at the most ideal locations. I instantly called my husband-to-be to tell him about all the details and he agreed for us to buy the membership. We planned for Singapore as the air fare wasn’t that high and the country had many beautiful locations to offer. Below are 5 ways the Accor Plus card helped me save during my honeymoon. 1) The Free Room Night at an International Hotel. What Really? While you are travelling internationally one of the major point of concern is accommodation. With Accor Plus it became so convenient for us to plan, even though there were so many choices we settled for Novotel Singapore Clarke Quay. The hotel was at one of the most happening locations in the city with a great view of the city skyline. We got a free room night as a member benefit and not just that, all our consecutive nights were at a 10% discount. Believe it or not we covered the complete cost of the membership with just this and there was still more to come. 2) Food at half the price! We dined at different Accor properties while touring the city and I was surprised to find an Accor property everywhere we went to grab our meals. Singapore is not a cheap country to travel for an Indian as the currency is 50x but at the same time having something like an Accor Plus travel card plays to your leverage. You get to dine at the most exclusive restaurants in the city at the cost of dining at a local restaurant. Not to miss, taking out your card at an International location to avail half the price for the meal feels quite elite. On our date night, both of us planned on looking our best. We went to the restaurant at our own hotel and decided to order a bottle of wine. With our card we availed a 15% discount on drinks along with our food. I was super excited about this. Getting an experience of fine dining on a date with a bottle of wine was an ideal set up and reward to our trip. 4) Exclusive Member Buffets – The paradise for foodies. We are both real foodies and hearing about buffets just gets us crazy. The sea food buffets exclusively for members helped us explore so many options. The Seafood buffet featuring Wok Fried Slipper Lobsters live station, Alaskan King Crab, Dungeness Crab, Baby Maroon Lobsters, Irish & US Oysters and more is something one shouldn’t miss. Our taste buds were so satisfied by the end of the meal. Even after giving us more than its value in Singapore, the Accor Plus card was still not letting us stop. To celebrate our first marvellous month of marriage we went to Honk in Pullman New Delhi Aerocity to enjoy their delicious Pan Asian cuisine. Again, the delicious taste left us wanting for more. My husband has never been appreciative of things I buy but the Accor Plus membership has been an exception. We have since then bragged about it to so many of our friends. Card’s value precedes the cost. It has offered me so many savings till now and I am definite of renewing this card next year as well. Looking forward to celebrating my birthday at an Accor Hotel soon to avail of my Group Dining Certificates. You just can’t surpass the only membership which gives a free room night stay across Asia Pacific. With over 800 hotels to choose from, Accor Plus has the largest collection by any hospitality company in all of Asia Pacific covering brands like Sofitel, Novotel, Pullman, Mercure and more. I planned a trip to Singapore with my mother in February and decided to get the Accor Plus membership to avail the free room night stay. We booked our stay at Novotel in Singapore using the membership well in advance to ensure the availability of rooms to avail the free room night stay. In addition to the complimentary night, the membership also offers Red Hot Deals on accommodation every Friday which entitle the member to up to a 60% discount on rooms when booked online. Sure enough, I sat with my laptop on a Friday evening in hopes of getting rooms at a 60% off, I wasn’t lucky enough to grab a 60% discount but I bagged a good 40% discount on the rest of our nights in Singapore. You just can’t surpass the only membership which gives a free room night stay across Asia Pacific. We had a very packed holiday schedule with a very busy itinerary. We were always on the go and like every tourist, we made sure to pack in a heavy breakfast to keep ourselves energised throughout the day. The discounts on the food bill are also applicable across Asia Pacific, hence we got a 50% discount on food and a 15% discount on beverages each morning we ate breakfast at the hotel and on whatever meals we had at the hotel. I believe this is the only membership which gives a 50% dining discount across hotels in Asia Pacific. A well maintained hotel, plush rooms and exotic local food at the hotel restaurants made Singapore really exceptional for us. Now that I’m recollecting all the benefits I availed in Singapore because of Accor Plus, I think I made the right decision to get the membership before the vacation.We are now planning a trip to Bangkok and I am told Accor has 29 hotels in Bangkok and a total of 48 hotels in Thailand, covering every possible location. I can’t wait to use my Accor Plus membership to avail benefits during my trip to Thailand. I highly recommend the membership to people looking out to travel in Asia Pacific. It’s just great value for accommodation and dining. I hear the Accor Plus membership will include the Raffles and Fairmont hotels from July 1, 2018. Wow! That would be completely irresistible. By the way, Accor Plus also entitles me to a whole range of dining and other benefits in my own city, New Delhi at Aerocity (Pullman, Novotel and IBIS) for the rest of the membership year. There are free meals, discounts and more on offer. I’m completely in love with this membership, would recommend all those looking out for a membership to go for it. Accor Plus: A high-value membership with a plethora of benefits across Asia Pacific for all the couples that love to explore more! I always thought of Accor Hotels to be reminiscent of a midscale French hotel chain with limited marquee hotels and a scattered presence in India. Accor Hotels made quite a buzz recently and caught my attention, having acquired the Fairmont-Raffles group, onefinestay, John Paul – a top global concierge company and a stake in the Banyan Tree hotel, Orient express and Rixos. It dawned on me that Accor Hotels is the world’s second largest hotel operator only after Marriott. Dining at one of the Accor hotels seemed nothing short of an obscure thought previously. But the more I delved into their dining ensemble the more it took me by surprise. They actually offer an exquisite mix of restaurants, lounges and bars across their prominent brands such as Sofitel, Novotel, Pullman, Mercure etc. Pling at the Pullman New Delhi Aerocity, in particular extends an exalted bar experience with live music and an international selection of wine and other elixirs, while Novotel Mumbai Juhu Beach is an absolutely fabulous beach front venue with five restaurants and a stunning bar called Gada da vida! After a brief presentation on the various benefits on offer, it became clear that the Accor Plus membership was a deal one couldn’t pass. So, I signed up without a second thought and got myself an Accor Plus membership. The well packaged membership pack consists of a membership card and a bunch of super value certificates. I feel that investing in a hotel membership that you use multiple times in a year is great value for money; it’s a gift that keeps giving 365 days of the year! This membership offers the best deal for honeymooners. Apart from the free room night stay across Asia Pacific, enjoy a 50% off on your dining bill each time you share a romantic meal with your partner at any of their 800 hotels in Asia Pacific and the dining discounts are available for larger tables too. For all those considering this membership, don’t just confuse it for a mere dining membership. With Accor Plus, say hello to a free room night stay at any Accor hotel in Asia Pacific, a 10% off on regular rates at any time and an array of RED HOT accommodation deals through the year. Curiosity got me asking about similar deals and I got to know that Accor Plus is the only card which allows you to avail a free room night stay outside India. What a selection?! From Beijing to Bangkok, Goa to Gold coast, Kolkata to Kuala Lumpur, Mumbai to Melbourne and beyond, the world is your oyster to explore and experience more! Take your pick from exotic locations in Asia Pacific and enjoy a complimentary night stay for two. Come to think of it, this membership offers the best deal for honeymooners. Apart from the free room night stay across Asia Pacific, enjoy a 50% off on your dining bill each time you share a romantic meal with your partner at any of their 800 hotels in Asia Pacific and the dining discounts are available for larger tables too. It is the only membership in India to give you the same dining discount across 1000 restaurants across Asia Pacific. Besides being an absolute money saving membership card, the membership comes with certificates offering a free meal, group dining discounts, birthday offers, wine and more. These certificates are valid across India and we also got some special ones for our own local city; pssst……do ask for those! One card offering membership benefits at 800 hotels and 1000 restaurants of the largest hotel company in Asia Pacific is surely something worth thinking about!